Having a great CBD Massage with Hemp Massage Oil. Balance Spa is now offering CBD Massage, a relaxing, pain-relieving massage that incorporates hemp extract made by Mary’s Nutritionals. We know there is a lot of misinformation about hemp and CBD out there, so here are some clarifications about their benefits and contraindications. There is a lot of good news: CBD is natural, won’t get you high, and is an effective tool for pain management! CBD is short for cannabidiol, a compound found in hemp plants, just like better-known THC (or tetrahydrocannabinol), the psychoactive chemical in marijuana. CBD and THC are each one of about 400 different chemical compounds found in hemp. Unlike marijuana, it is legal to grow industrial hemp because the plant is required to have low amounts (less than 0.3 percent) of THC. CBD can be made synthetically in a lab or factory, or naturally. Some companies, including Mary’s Nutritionals, choose to use the whole hemp plant to make their extracts. This process retains all the beneficial compounds, including CBD, from the hemp plant. But because the plants must have very low THC content, whole hemp extract is not psychoactive. It’s important to emphasize that the effects of CBD are very different from the effects of THC. Whole hemp extract and CBD won’t make you feel “high” – they’re non-euphoriants and non-inebriating. In fact, some strains of marijuana are specifically favored for their high CBD content, because CBD is believed to counteract some of the negative effects of THC, such as paranoia. Whole hemp extracts make it possible to experience the medicinal benefits of the hemp plant without exposure to psychoactive THC. Finally, drug tests (such as those used for employment) usually look for THC and its byproducts and would not pick up on CBD use. That said, CBD massage might not be right for everyone. There is a small risk of skin reactions (as with any topical treatment), so make sure to discuss your chemical sensitivities with your massage therapist. If you have an immune system condition or are taking medications, CBD may interact with your system differently than other people’s. Talk to your doctor about all supplements you’re using, including topical ones. To understand CBD, we need to take a quick dip into biochemistry. Your body has a complex system of naturally occurring compounds, called cannabinoids, and receptors for those chemicals that respond to them. The receptors and compounds make up the endocannabinoid system. Chemicals from the cannabis plant (hemp) are called phytocannabinoids and can interact with your body’s endocannabinoid system. The endocannabinoid system is powerful — it affects the nervous system, pain perception, and even gastrointestinal functions. That’s why CBD and hemp extract can be so effective. You might have noticed that CBD is already being used in a multitude of products, like pain relief patches, calming supplements for pets, FDA-approved treatments for pediatric epilepsy, drinks, and more. Current scientific research supports these uses because hemp extracts are effective for pain control and have very limited adverse effects. CBD is an anti-inflammatory analgesic, which means that it decreases both inflammation and pain. Although it will not make you high, CBD can help with insomnia and anxiety, though scientists have not yet tested those effects in clinical trials. 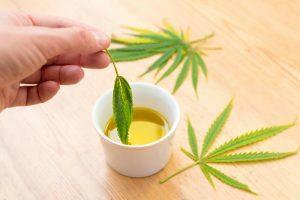 Researchers haven’t figured out how hemp products are best absorbed, in part because CBD and hemp extracts are usually taken orally during scientific studies. Nonetheless, many patients find CBD creams effective for pain relief, and topical treatments are certainly better for your lungs than smoking marijuana. How can a CBD massage help you? Our CBD massage uses a combination of Mary’s Nutritionals’ hemp extract and Muscle Freeze, which are both formulated to provide 3-4 hours of localized pain relief. Muscle Freeze also contains menthol, which can provide an immediate cooling and soothing effect. Both products also work to decrease inflammation. This massage would be ideal for anyone with sore muscles, from elite athletes to weekend joggers. It might also be beneficial for people struggling with joint pain, including arthritis. Finally, the calming effects of a massage and CBD can help support anyone with anxiety or high stress. You may schedule a CBD Massage session through our online booking system or call us at 561-208-8111 for further information.